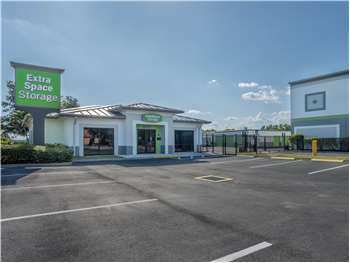 Located near the intersection of SE Gran Park Way and Hwy 1, Extra Space Storage serves residents of Stuart, Port Salerno, and Palm City. Locals will recognize our facility near Port Salerno Elementary School. Looking for secure storage close to the airport? Extra Space storage is about 2.8 miles from Witham Field, providing a reliable option for residents and visitors who need a storage unit or vehicle storage in Stuart. Extra Space Storage on SE Gran Park Way offers a wide range of storage unit sizes, climate-controlled storage, vehicle storage, and exceptional security. We're your ideal storage partner in Stuart! The team at Extra Space was very helpful, thoughtful and accommodating. They worked with my restricted schedule, even stayed a little late to help me. The place is ALWAYS clean and well kept and the security is comforting. I wouldn't use any other company. Having spent 35 years in the moving and storage industry, I find ExtraSpace Storage facility at 2990 SE Gran Park Way, Stuart, FL to be one of the best I have ever visited. The desk personnel couldn't be more helpful. It is well lit, extremely clean and an overall great operation! Susan is a huge asset to this company. I wouldn't go anywhere else for my storage needs as long as she's there with her warm welcome and smile... thank you Susan !!! I felt they went out of their way to help me and my husband find just what we were looking for as far as a storage unit. They weren't pushy and when we had to change sizes and dates, they were fine. Just very helpful. I appreciate the love shown when i went in to inquire on a storage space. I'm currently without a home, and the customer service skills of your employees made me feel so much better. Between Salerno & Pomeroy, located next to Stuart Commerce Center sign. Head south on US 1. Pass Indian St, turn left onto Gran Park Way at Stuart Commerce Center sign. We are located just behind the old Cowboy’s restaurant, next door to Corvette Corral (a big yellow building). About half a mile south of Walmart. Head north on US 1. Pass Salerno Rd, turn right on Garn Park Way at Stuart Commerce Center sign. We are located just behind the old Cowboy’s restaurant, next door to Harley Davidson. About half a mile south of Walmart. From Dixie Hwy, head west to US 1. From Indian St, turn left onto US 1, turn left onto Gran Park Way at Stuart Commerce Center sign. We are located just behind the old Cowboy’s restaurant, next door to Corvette Corral (a big yellow building). About half a mile south of Walmart. From Salerno Rd, turn right onto US 1, turn right on Garn Park Way at Stuart Commerce Center sign. We are located just behind the old Cowboy’s restaurant, next door to Harley Davidson. From I-95 or Florida turnpike take Kanner Hwy (State Rd 76) to Cove Road or Salerno Road. Turn left onto US 1, turn right on Garn Park Way at Stuart Commerce Center sign. We are located just behind the old Cowboy’s restaurant, next door to Harley Davidson.